There are plenty of reasons to worry about fracking—groundwater contamination, methane leaks, that flaming tap water thing. But can it really cause earthquakes? That’s the question the US Geological Survey set out to answer after a spate of tremors in the Midwest—an area not usually known for earthquakes—alerted scientists to the possibility that some of them might be man-made. Seismic activity in the Midwest started increasing around 12 years ago but picked up significantly in the past few years, says seismologist Bill Ellsworth, the lead author of a new USGS study examining potential links between fracking and earthquakes in the region. Since 1970, the baseline for earthquakes in the Midwest measuring above a 3.0 hovered at around 21 per year, but beginning in 2001, that number began to rise. There’s been a “remarkable increase” in the past few years: The number of 3.0-plus earthquakes rose from 29 in 2008 to 50 in 2009, then to 87 in 2010, and in 2011 to a staggering 134. Something unusual was going on, but what? As Ellsworth and his colleagues at USGS ask in the study, “Is this increase natural or manmade?” And if it’s man-made, is fracking—which has ramped up in the region in the past several years—to blame? According to the study, the answer to the first question is “almost certainly.” But the second one is a little more complicated. Though fracking does cause tiny tremors, the USGS scientists found no links between the process of fracking itself and the larger earthquakes that have been occurring more frequently. They did, however, notice that earthquakes have clustered around wastewater wells in Oklahoma, Arkansas, and neighboring states. Disposing of wastewater by pumping it deep into the ground is standard practice in many industries, including mining, chemical manufacturing, and oil and gas extraction, and the oil and gas industry alone operates tens of thousands of wastewater disposal wells. But the recent surge of fracking activity, which uses millions of gallons of water to crack rock deep in the ground and release natural gas, has boosted the volume of wastewater being injected into the ground. 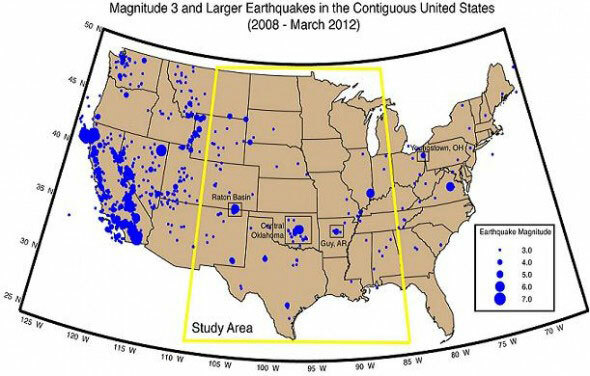 Most earthquakes caused by fracking-related processes are relatively small. But it’s possible that wastewater disposal could induce larger earthquakes: A new study by University of Memphis geologist Stephen Horton concluded that a 5.6 quake in Oklahoma last November “was possibly triggered by fluid injection” at nearby wastewater wells. It’s not news that deep-earth fluid injection can cause increases in seismic activity: Nearly 50 years ago, scientists traced a series of earthquakes near Denver to huge injections of wastewater at the Rocky Mountain Arsenal. And scientists have long observed that the extraction of large quantities of gas, oil, and water from the ground can affect existing stresses in unpredictable ways. Still, researchers caution, the new data is preliminary, and plenty of questions remain. We don’t yet know why only a few of the tens of thousands of wastewater disposal wells have induced earthquakes, or whether any specific planned well is particularly likely to cause a quake. It could be because production has ramped up and the sheer quantity of wastewater has increased, or because oil and gas companies are using new techniques for injecting waste fluids. And while there have been no confirmed cases of major earthquakes resulting from the injection of wastewater into the ground near major faults, the possibility can’t be eliminated, says Deputy Secretary of the Interior David Hayes. Many regulators aren’t taking any chances. After a series of earthquakes in northeastern Ohio, including a 4.0 quake in Youngstown on New Year’s Eve, state regulators ordered natural gas drillers to suspend development of several deep-injection wastewater wells and issued a new set of standards for frack-water disposal. In Arkansas, dozens of earthquakes near wastewater disposal sites related to the state’s huge Fayetteville Shale deposit led the Arkansas Oil and Gas Commission to shut down an existing disposal site and issue a moratorium on the development of new ones. But because oil and gas companies are exempt from the provisions in hazardous waste regulations aimed at preventing induced earthquakes, there’s a gap in regulation at the federal level, though the EPA is currently working to draft recommendations for state regulators. So, does fracking cause earthquakes? Not exactly, but the way companies dispose of fracking waste can, which means that other types of energy-related activity that rely on fluid injection—enhanced oil recovery, enhanced geothermal systems, carbon capture and sequestration—also have the potential to cause quakes. Still, the evidence suggests that we can add earthquakes to the growing list of fracking-related hazards, alongside air pollution, tainted drinking water, and potentially outsized carbon emissions.